Summer is around the corner and road trip season is almost upon us! The itinerary and reservations are set. Our car has visited the dealer for a maintenance check. Kids are safely strapped into their seats and we’re ready to go. But what about the safekeeping of insulin and our other medical supplies? The astronomical costs of these supplies and the extent to which we rely on them warrants some thoughtful consideration. Last summer this topic was front and center for us as I planned our four week road trip to Colorado. With diabetes, celiac and food allergies, there are lots of supplies to bring. These supplies proliferate when you’re planning an extended road trip. Safekeeping this precious cargo as you move in and out of various accommodations gets pretty complicated! Add summertime to the mix and you have a real concern — keeping your supplies safe from the perils of summer heat. Where there are worries, there are solutions. I’d like to share some of my own. I’m hoping that you’ll share your solutions, too. 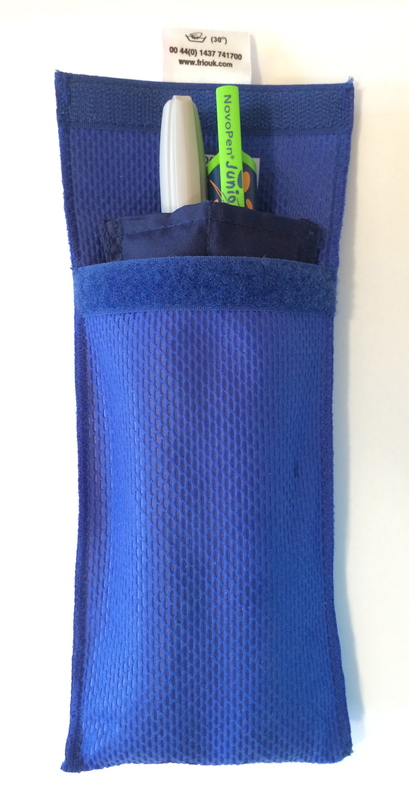 Frio insulin cooling wallets are great for protecting your opened insulin from extreme heat. They’re affordable, portable and reusable. We keep Frio packs with us for our day outings. They have been quite useful! Climapaks: This device maintains your insulin between 44 and 77 or 86 degrees (depending on the insulin) whether you’re in hot weather or cold through battery power. The charge lasts 3 – 5 days. The expense is quite significant at $299. You can rent it for $9 a day, minimum 5 days and shipping is included. We haven’t used it but you can check out two great reviews from Christina Ghosn of the blog Stick with it Sugar and Allison N. of Diabetes Mine – the all things diabetes blog. Medicool has several products that keep insulin in cases of various kinds with a cooler pack. They include: Dia-pak Classic, Dia-pak Daymate and Insulin Protector. What if you are bringing extra insulin and don’t want to start the 28 day clock ticking toward expiration? If this is the case, you must keep the insulin cold — or refrigerated. For most types of insulin, that means keeping the vials / pens at 36 – 46 degrees. It is widely suggested that you bring at least double the supplies you would normally need. If there was leftover insulin after your trip, it would be nice to place it back in the fridge! When carting around extra vials or pens of insulin, we have successfully used the following option: good old-fashioned coolers. 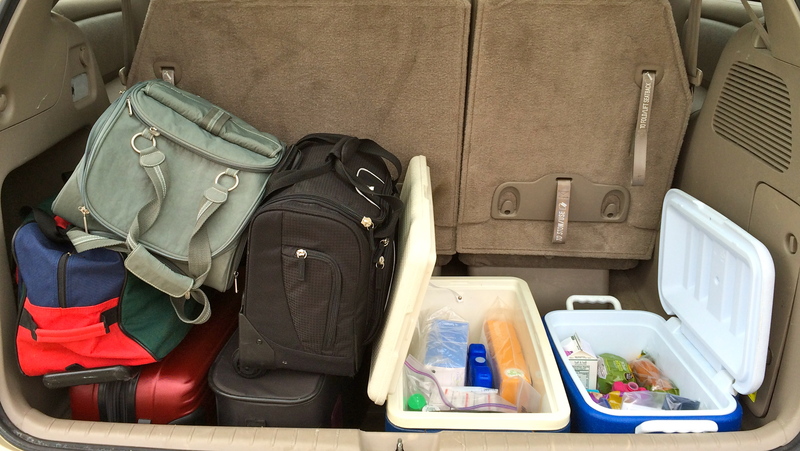 We use two large coolers during our road trips and bring several smaller ones along for short outings and snacking in the car. 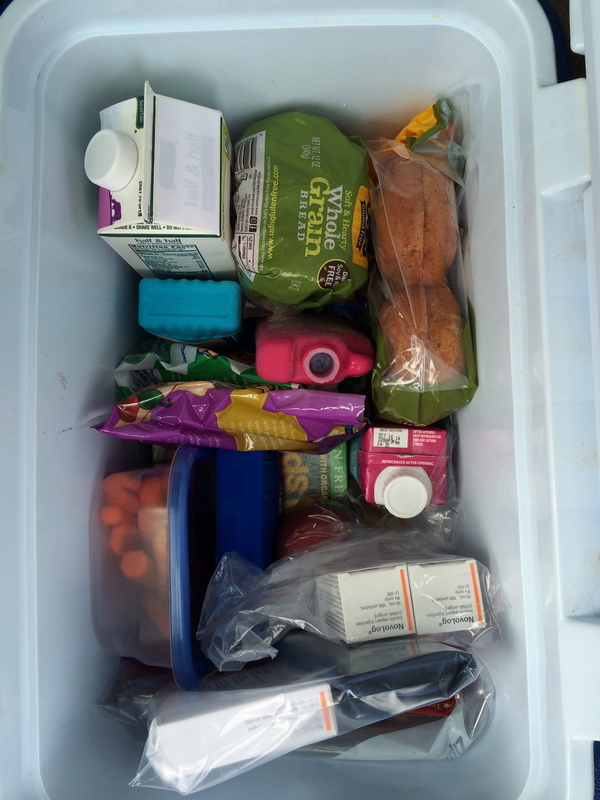 The “cold cooler” holds the insulin and special foods for N (N has celiac disease and a life-threatening food allergy which limits his dining options on the road). Note: Never place insulin directly on ice or an ice block! The “cool cooler” has only a couple ice blocks in there. We store the majority of our medical supplies in it that do NOT require refrigeration. Most diabetes supplies and extra Epi-pens and even pharmaceuticals need to be protected from excessive heat. According to the Weather Channel, the temperature inside a car can reach 138 degrees after sitting in the sun for 1.5 hours in 90 degree heat. Wow — that’s hot! The “cool” cooler has CGM sensors, Omnipods, BG strips, pharmaceuticals, gummy packs for low BGs and additional supplies. Plastic bags are used to protect them from the ice blocks’ moisture. The “cold” cooler holds the back-up supply of insulin, special foods, some healthy snacks and more. There are plug-in refrigerators or coolers made for automobiles. We owned a Koolatron and used it with a previous minivan that had a power source that was live even when the car was turned off — handy for leaving your car behind for an hour or two. It had an adapter so we could use it in the hotel room as well. The downside was that it sometimes froze items in a lower corner and it was fairly loud. We stopped using it some years ago — mostly because our needs outgrew its small size. Medicool also has a product called Medicooler which is a small, portable micro fridge. It keeps insulin cooled by plugging it into an auto outlet in your car or plugging it into a standard outlet in your hotel room. The majority of the reviews on Amazon give it only 1 star. I’ve never tried it but wouldn’t personally recommend it after reading these reviews. Many hotels these days have mini-fridges available in the hotel rooms. If your hotel doesn’t offer this amenity, they may have small fridges available for use if you cite your medical need. Sometimes they’ll charge a fee. This is best arranged ahead of time. So do you put your insulin right into the fridge? On our road trip last summer, I didn’t. Those mini-refrigerators freeze items way too often for my comfort! For a multiple night stay in a hotel room, I will place some food items inside on the first night. We fill our (now empty) large cooler with ice from the ice machine and set the insulin in a small soft-sided cooler with the top open inside. (I did tell you that I bring lots of coolers!) If nothing freezes after the first night, then the insulin goes into the fridge for the remainder of our stay. What about all of those ice blocks? We bring them to the front desk in a large plastic bag, put our name and room number on it, cite our medical needs and ask them to freeze the blocks overnight. The hotel staff have always been very accommodating and we are grateful for this! If you’d like to know more about safekeeping insulin, Wil Dubois of Diabetes Mine wrote an interesting article entitled Tracking Insulin’s Health in the Summer Heat describing the manufacturers’ storage temperature recommendations, what experts had to say and more. Check it out. If you’re hitting the road this summer, best of luck to you and your family on your journey! 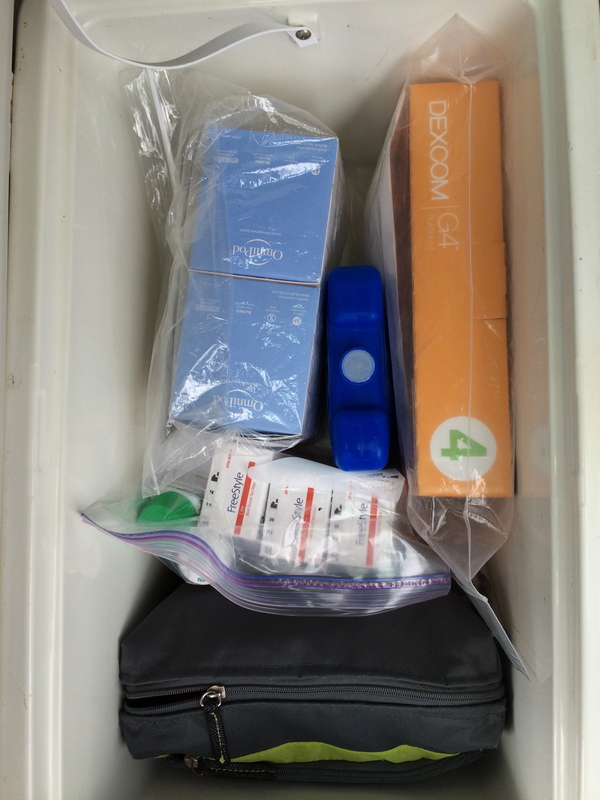 I’d love to hear about how you have provided safekeeping for your medical supplies. Drop me a line!